Xi Jinping met with Italian President Sergio Mattarella in Italy, where the two leaders signed a memorandum of understanding on the Belt and Road Initiative. Official media emphasized the role Italy can play in promoting China-EU cooperation. The CCP marked the 60th anniversary of Tibetan “liberation” with a white paper on “60 Years of Democratic Reform in Tibet” and other commentary (see Propaganda Work section). The CCDI and NSC announced the sentencing of former Propaganda Department Deputy Head Lu Wei to prison as well as former Interpol Chief Meng Hongwei’s expulsion from the Party (see Party Discipline section). 3.22 Xi Jinping traveled to Italy to meet with Italian President Sergio Mattarella, who signaled Italy’s participation in the Belt and Road Initiative (BRI) by signing a memorandum of understanding on the subject. 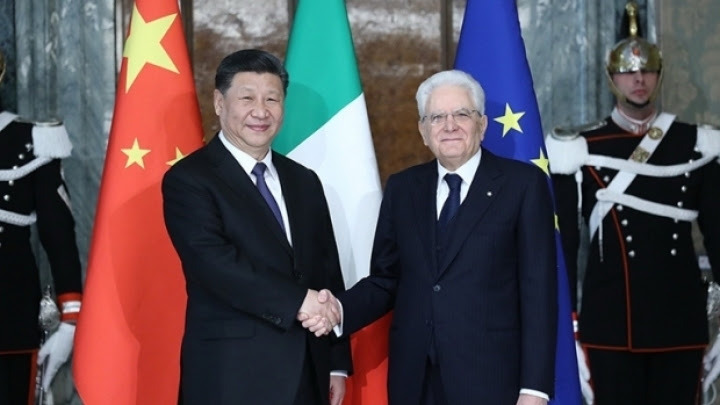 According to People’s Daily, Xi told Mattarella that he hopes Italy will continue to play an active role in promoting partnership between China and the European Union. In return, China will strengthen cooperation and communication over UN affairs, global governance, climate change, and the 2030 Agenda for Sustainable Development, and will jointly advocate for trade and investment liberalization, and guide economic globalization toward a more open and inclusive order. 3.24 Politburo standing committee member Han Zheng (韩正) attended the opening ceremony of the 2019 China Development Forum (CDF). In his speech, Han emphasized that “China [...] has achieved a historical shift from closed, to half-closed, to fully open” and that China's economic progress in the past was tied to its opening up, and China's future high-quality development will necessarily hinge on further opening up. To that end, China should promote the Belt and Road Initiative (BRI), equally focus on "bringing in” (引进来) and “going out” (走出去), increase imports and decrease tariffs, loosen restrictions on foreign investment, allow full foreign ownership in more industries, and increase protection of intellectual property rights. The opinion was further explained and publicized in a People’s Daily commentator article. 3.28 At the opening ceremony of the Boao Forum in Hainan on 28 March, Li Keqiang delivered a keynote speech titled, “Working Together to Meet Challenges and Achieve Common Development.” Li Keqiang noted in his speech that the current international environment is undergoing profound changes, and no country can afford to ignore the challenges this will present. All parties should seek mutually beneficial cooperation and “safeguard the international system with the UN as the core” (维护以联合国为核心的国际体系) and actively promote the multilateral trading system based on rules. Li Keqiang pointed out the importance of Asia as a stabilizing force and the engine of world growth, urging for the completed negotiation of the Regional Comprehensive Economic Partnership Agreement (RCEP) and joining China’s Belt Road Initiative (BRI). Regarding China’s economy, Li Keqiang made note that opening to the world is part of the PRC’s basic national policy, towards which the new Foreign Investment Law passed by the NPC is an important step. He promised more supporting regulation to be unveiled before the end of the year. Li Keqiang emphasized that China will continue to treat foreign and domestically funded enterprises equally, strengthen IP protection, and maintain current investment policies in Hong Kong, Macau, and Taiwan. He also promised to reduce the cost and improve the efficiency of custom clearances. Li Keqiang pointed out that the economic situation in China this year has had several positive changes, with market expectations significantly improved though uncertainties and external risks have increased. He iterated that China will not resort to “big flood irrigation” (大水漫灌) style stimulus policy, and will continue to focus on reform and opening up, innovation, and tax reductions. This he assured will allow China’s economy to experience “long term stable growth” (长期向好稳定发展). 3.29 Xi Jinping presided over a Politburo meeting that deliberated on the CCP’s work regulations for party leadership groups (中国共产党党组工作条例) and the management of the education of party members (中国共产党党员教育管理工作条例). 3.25 People’s Daily used its Zhong Sheng (钟声) column, which authoritatively transmits the publication’s opinion on matters of international affairs, to write about Xi Jinping’s state visit to Italy from 21 to 24 March. According to Zhong Sheng, Italy has been at the forefront of China’s relations with European Union countries. During Xi’s visit, the two countries reached a “broad consensus” on bilateral relations and international and regional issues of common concern. China and Italy issued a joint communique on strengthening comprehensive strategic partnership, which began 15 years ago. 3.28 A People’s Daily editorial marked the 60th anniversary of Tibet’s “democratic reform,” as well as the 10th year of Tibet’s “Million Serfs Liberation Day” (西藏百万农奴解放纪念日). Since 1959, the CCP has carried out “democratic reform,” abolishing the theocratic feudal system, and has created a “new era” of Tibetan history. The Central Committee with Xi at its core attaches great importance to Tibet’s development and stability. Here, China can follow the Central Committee’s “six musts” (六个必须), as well as its strategy regarding the border, which says that “to rule the country, you must rule the border; to rule the border, you must first stabilize Tibet” (“治国必治边、治边先稳藏”). 3.27 The China Tibet Culture Protection and Development Association and the China Tibetology Research Center (CTRC) held a press conference in Beijing to release a series of books on the 60 years of democratic reform in Tibet. China Tibetology Publishing House President Hong Tao (洪涛) introduced the books and stated that the series presents Tibet’s historical achievements, as well as prospects for its future. After the press conference, more than 100 academics attended a seminar about the 60th anniversary. 3.28 A People’s Daily commentator article reported on the State Council Information Office’s recent white paper, "Democratic Reform in Tibet–Sixty Years On," which calls attention to Tibet’s transition from feudal serfdom to socialism via democratic reform. The white paper is availablein English. 3.26 The Central Organization Department, United Front Work Department, and State Ethnic Affairs Commission jointly held a training session for cadres from the western region and other ethnic minority areas in Beijing. The training session is part of a program that has been in place since 1990. 211 cadres from 19 localities and the Xinjiang Production and Construction Corps (新疆生产建设兵团) participated in the training. After the training class, Xinhua reported that the officials would be deployed to 82 different party and state organs and key state-owned enterprises for one year of training. According to Xinhua, participating cadres studied Xi Jinping Thought on Socialism with Chinese Characteristics for a New Era, the current economic situation and how to prevent major risks, deepening the reform of party and state institutions, and strictly managing the party and the nation. 3.26 Former Central Propaganda Department deputy head and the Office of the Central Internet Security and Informatization Leading Group (the Cyberspace Administration of China) director Lu Wei (鲁炜) was sentenced to 14 years in prison for the crime of bribery. The investigation against Lu showed that Lu had been using his Party and government positions from 2002 to 2017 to provide assistance to organizations and individuals in return for bribes. 3.27 The CCDI and NSC announced the Meng Hongwei (孟宏伟), former Interpol Chief and former Deputy Minister of Public Security, had been expelled from the Party and from public office. Upon investigation, the CCDI and NSC reported that Meng Hongwei was found to have “no Party principle, no organizing ideology, does not report personal matters in accordance with regulations, resists organization, and does not implement the Central Committee’s decisions.” The report also highlighted his family’s extravagant lifestyle, his wife’s use of Meng’s status to further her own interests, and Meng’s history of accepting bribes. Wei stated that China “supports Egypt’s efforts in defending its independence and sovereignty” and that China is willing to strengthen cooperation with Egypt and push forward the relationship between the two militaries. Wei met with Egyptian Minister of Defense Sedki Sobhy Sayyid Ahmad on 24 March. 3.26 During Wei Fenghe’s visit to Saudi Arabia, he met with Saudi King Salman bin Abdulaziz Al Saud and Saudi Crown Prince Mohammed bin Salman Al Saud in Riyadh respectively. The King and the Crown Prince both praised the cooperation between Saudi Arabia and China, including the Belt and Road Initiative (BRI), and expressed hope for further cooperation in the future. 3.21-3.24 Organization Department Deputy Head Jiang Xinzhi (姜信治) led a CCP delegation to Brazil. While there, the delegation met with Brazillian political leaders, including President of the National Congress and President of the Federal Senate Davi Alcolumbre, President of the Chamber of Deputies Rodrigo Maia, Social Liberal Party President Luciano Bivar, and Democrats President Antônio Carlos Magalhães Neto. 3.23-3.25 On 23 March, Song Tao traveled to Singapore and met with the Singaporean Minister for Foreign Affairs Vivian Balakrishnan (维文). The following day Song and Chinese Ambassador to Singapore Hong Xiaoyong (洪小勇) observed community grassroots party construction work with Senior Minister of State for the Ministry of Communications and Information & Ministry of Culture, Community, and Youth, People’s Action Party (PAP) Deputy Government Whip, and Holland-Bukit Timah Group Representation Constituency member Sim Ann (沈颖). On 25 March, Song met with PAP First Assistant Secretary-General and Singaporean Minister for Finance Heng Swee Keat (王瑞杰). On the same day, Song met with PAP Secretary-General and Singaporean Prime Minister Lee Hsien Loong (李显龙). 3.24-3.27 At the invitation of the Justice and Development Party (JDP), Central Committee member and Guizhou Party Secretary Sun Zhigang (孙志刚) led a CCP delegation to Morocco. While there, he delivered a keynote speech on poverty alleviation in Guizhou at the Academy of the Kingdom of Morocco and met with Moroccan political leaders, including JDP General Secretary and Prime Minister Saadeddine Othmani and Authenticity and Modernity Party General Secretary and House of Councillors President Hakim Benchamach. 3.25-3.27 Jiang Xinzhi led a CCP delegation to Argentina. While there, the delegation met with Argentine political leaders, including Provisional President of the Senate Federico Pinedo and Republican Proposal President Humberto Schiavoni. 3.26 International Department Deputy Head Li Jun (李军) met with a National Congress of Argentina delegation led by Chamber of Deputies Argentina-China friendship group headCarmen Polledo. 3.26 International Department Deputy Head Wang Yajun (王亚军) met with a Japanese delegation led by Liberal Democratic Party International Bureau Director-General Ryuji Koizumi. 3.26 Guo Yezhou met with an American delegation led by Asia Society Policy Institute Vice President and former Assistant Secretary of State for East Asian and Pacific Affairs Daniel R. Russel. 3.26-3.28 On 26 March, Song Tao attended and delivered the keynote address at a “Neighborhood Party Talk” event entitled “Implement the Presidents’ Consensus to Promote China-Philippines Friendship” in Manila. Those in attendance included Partido Demokratiko Pilipino–Lakas ng Bayan (Philippine Democratic Party–Power of the Nation/PDP–Laban) Vice President and Secretary of Energy Alfonso Cusi, Nacionalista Party representative and House of Representatives Deputy Speaker Pia Cayetano, and Lakas–Christian Muslim Democrats President Martin Romualdez. On the same day, Song and Cusi signed a memorandum of understanding on entrusting relevant organizations to carry out cooperation related to people’s livelihood between the CCP International Department and PDP–Laban. On 27 March, Song traveled to Davao to meet with PDP–Laban leader and President of the Philippines Rodrigo Duterte. On 28 March, Song returned to Manila to meet with National Security Adviser Hermogenes Esperon. On the same day, Song met with Senate President Tito Sotto. 3.27 Wang Yajun met with a Laotian cadre study led by Lao People’s Revolutionary Party Organization Department Deputy Head and Party Committee Deputy Secretary Vanxay. 3.27 International Department Deputy Head Qian Hongshan (钱洪山) met with a German delegation led by Social Democratic Party of Germany (SPD) Deputy Head Rolf Mützenich and SPD Bundestag group First Secretary Carsten Schneider. 3.28 Qian Hongshan met with the Swiss Ambassador to China Bernardino Regazzoni. 3.29 Qian Hongshan met with the Austrian Ambassador to China Friedrich Stift. 3.27-3.30 At the invitation of the Nidaa Tounes (NT) party, Sun Zhigang led a CCP delegation to Tunisia. While there, the delegation met with Prime Minister Youssef Chahed and party leaders from the NT, Ennahda Movement, and Tahya Tounes.